A YANKEE MAN O' WAR. It was down in yonder meadow I carelessly did stray. Says he, "My pretty Susan, I soon must leave the shore. To cross the briny ocean in a Yankee man o' war." "How can you be so venturesome, to throw yourself away? For by the time I'm twenty-one I shall receive my store,. Jolly sailor, do not venture in a Yankee man o' war." 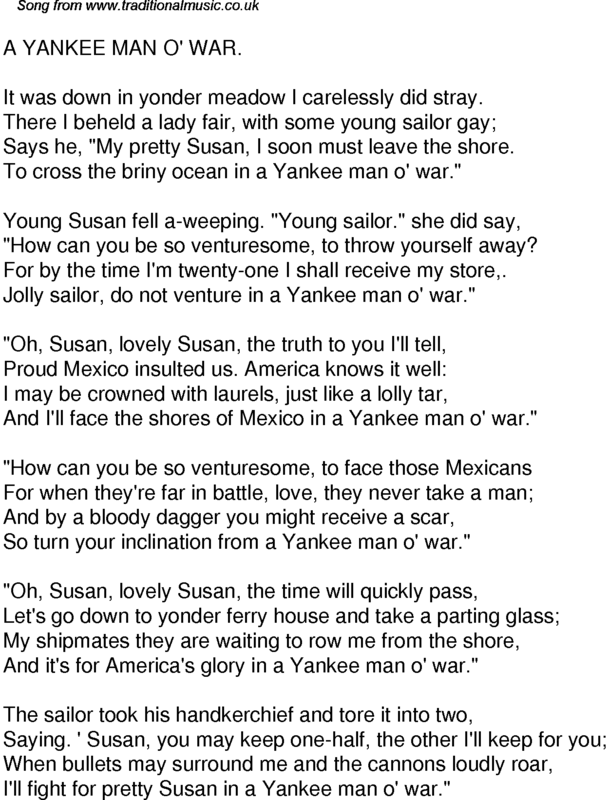 And I'll face the shores of Mexico in a Yankee man o' war." So turn your inclination from a Yankee man o' war." And it's for America's glory in a Yankee man o' war." I'll fight for pretty Susan in a Yankee man o' war."